Fashion forward LA shoe designer George Esquivel talks shop, shares his current LA obsessions and reveals the only travel shoe you need! If there’s such a thing as a sartorial Cinderella story, George Esquivel is living it. Once upon a time, the fashionable shoe designer ran an under-the-radar bespoke business in Los Angeles, catering mainly to in-the-know trendsetters. But that all changed in 2009, when fashion’s fairy godmother—Vogue editor-in-chief Anna Wintour—waved her magic wand and named Esquivel a CFDA/Vogue Fashion Fund finalist. Although he didn’t score the big cash prize, he’s still considered a prince among LA designers, with stars like Bruno Mars, Janelle Monáe and Emma Stone sporting his kicks, and major retailers like Net-a-Porter and Bergdorf Goodman now selling them. Most recently, he’s turned his West 3rd St. atelier into a super-shop of footwear amazingness, enlisting neighboring shoe store DF Feet to fill the ground floor of his made-to-measure studio space. Behold: DF Feet/George Esquivel. We chatted with the LA shoe designer to find out more about this new venture—and to pick up a few of his style secrets. Time Out Los Angeles: Tell us about the new store! 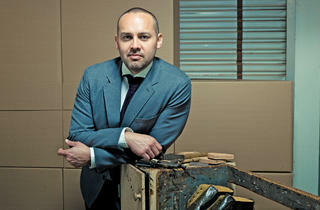 George Esquivel: DF Feet has always carried my inventory, and I did made-to-measure shoes in my showroom. So we thought, why don’t we combine everything and turn my studio, which is basically a beautiful little house, into a store? You enter through the back of the Douglas Fir clothing store, and there’s a courtyard where you can hang out and have a coffee or a glass of wine under the trees. Now that fall has arrived, we all have cool-weather shoe shopping on the brain. What style do you think every guy and gal needs for this season? Every guy needs either a brown or cordovan lace-up boot. I’m a boot guy, even in the summer. I love the ruggedness. I’ve also noticed that with guys, I’m seeing more and more freedom of expression—blue, green and oxblood are all really popular shoe colors right now. For women, I really like boots as well, but ones that are a little funky, not so perfect. I did a gold combat boot for Net-a-Porter and girls are just going crazy for it. It’s a bright gold, but we distressed it so it looks like you’ve walked a few miles in it. What are you personally coveting for fall? I’m obsessed with anything by Michael Bastian and Billy Reid; I really love their blazers. My other new obsession is a website called Etiquette Clothiers, they do underwear and socks for men and women. You need to check them out. And when I like to dream, I visit Westime to look at watches. I haven’t bought a new watch in a while because my daughter’s now in college, but I’m partial to Bell & Ross. I’m not a guy who wants a really complicated, expensive watch; I need something that I can pound and beat up. I hear that you took 11 trips to Europe last year. What’s one of your must-pack items? My black Nike Frees. I only travel with black sneakers—you can use them for the flight, and they’re also great for running around the city or for exercising. One shoe does it all. When you’re not in your showroom, where in LA can we find you? To be honest with you, I really don’t shop that much. I love to mountain bike, so when I have some free time I just get outdoors; I like Aliso and Wood Canyons or El Moro in Newport Beach. We just had my wife’s 40th birthday party at the Spare Room. We actually designed their bowling shoes and are working with them on a new shoe design that will hopefully be there before the holidays. I also love Animal, and the cheesecake at Canter's is amazing.